Are you tired of being on the road, and wish you had more central locales to shoot at your friends with vehicles while people pay to watch? 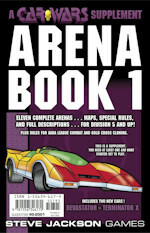 If so, we recommend Car Wars Arena Book 1, newly released to e23. It includes information on the AADA, the Gold Cross clone bank, four new vehicles, and an assortment of new counters -- plus, of course, 11 arenas, ready for Car Wars mayhem. Your road rage doesn't need to be confined to the roads any more; now you can transfer your aggression to arenas, where you can compete against other drivers for big money!